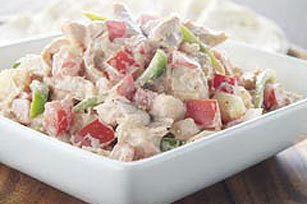 Give your chicken salad a makeover with our Mexican Chicken Salad recipe. Salsa, chili powder and peppers give Mexican Chicken Salad its signature taste. Mix mayo, salsa, garlic and chili powder in large bowl. Substitute 2 pkg. (6 oz. each) OSCAR MAYER CARVING BOARD Flame Grilled Chicken Breast Strips, chopped, for the cooked fresh chicken. Fold napkin in half. Turn napkin long way and make 10 pleats in 3/4 of the napkin. Fold napkin in half again with pleats on the outside. Bring all 4 points at A to B. Set napkin upright on table. Let go of the pleats first, then the base. Help your friends and family eat right with this delicious salad that is prepared with better-for-you products! Plus, you'll get a good source of vitamin C from the peppers.